Remember when I was telling you guys about my foolproof top? Well, I ended up ordering both of the other colors. I figured for as much as I wore the first one, the other two will get plenty of air time. And yes, this is the second pair of Pedro Garcia shoes you are seeing in one week. Completely not intentional, just really trying to make sure all my fall shoes get the appropriate attention and I loved the way these grounded the outfit. Another week, another trip, right? October is going to be a very busy month for me and it all starts this weekend. The husband has a work conference to attend in Montreal. Neither of us have ever been, so we're going to go ahead and make a long weekend out of it. The conference doesn't start until Monday, but we are flying in Saturday to explore the City for the weekend. Anybody been before? Suggestions? The conference is Monday and Tuesday, which will give me the chance to work during the day myself from the hotel. That's the great part of my job-- that I can really do it from anywhere. I did the exact same thing when I was in California meeting my nephew! I do wish my work laptop didn't weigh a thousand pounds, but otherwise, it's sometimes nice to work away from the office because you don't get the distractions of your phone ringing, or people stopping by your desk for random conversations, or getting tempted by food and coffee in the kitchen! I was looking at photos of Montreal, and it looks like a little mini Paris! Perhaps I should wear my third color of this shirt there since it's navy and white stripe, which is always a very Parisian color combo in my head! 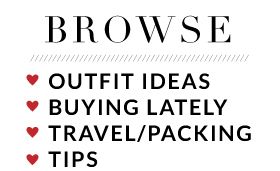 Now off to research shopping options! Cool I have family in Montreal but I've never been, this look is very Parisian and I love this embellished sweater. Thanks! I'm very excited for the trip. A coworker was able to get eating and shopping recs for us! Can't wait!! How fun! Enjoy your getaway! You look fab, as always, dear! You're so sweet, lady, thanks! Sadly I feel like there is nothing that comes close to this bag!! The print is so hard to beat, you know? But I'm always on a lookout for a good dupe so I will let you know whenever I find a good one! 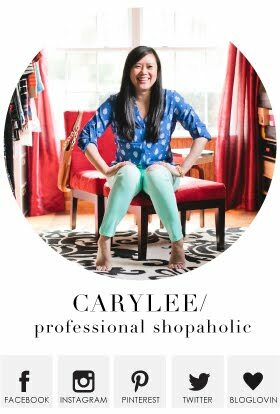 Killer shoes and I totally support getting every color of an item you love! So glad you agree! Why mess with perfection, right? Just stock up!! 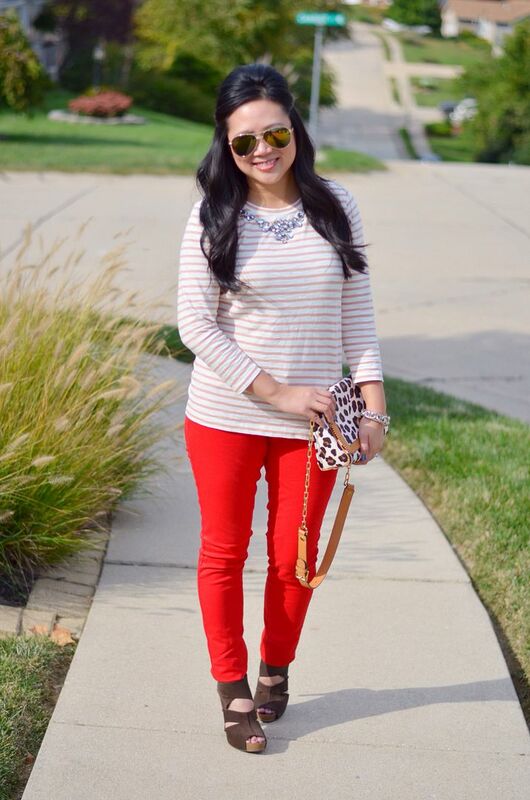 Stripes are my go to look for fall!! I love yours with the red, and your necklace is so pretty! Happy Thursday! Well, the best part is that the necklace is part of the top! Genius, huh! All I had to do was throw on a bracelet and I was done. Seriously one of the many reasons why i love this top!! Love this look, stripes are always my go to. Your shoes are perfect for fall, love the suede and colour. Have fun in Montreal!! Loving this whole look. The color and the stripe just look lovely here! I never been to Montreal, but I do want to go there. If you have time, I highly recommend visiting Quebec, I love it there. Good to know - thanks! Pretty excited for the weekend! Thanks so much! They're comfy and I love the fit! Thanks! I am excited for pictures and shopping and yummy food! These shoes are fabulous! Love this entire look! Have a great trip! And yes, I love the shoes! They're so comfy, too! Great outfit! Love the shoes. Enjoy Montreal. I was there many years ago and remember it as a beautiful city. That's great! Makes me even more excited hearing that! Super cute! It is so awesome your work is flexible like that. Being able to work in different places really opens up a lot of opportunity for travel! Yes absolutely! Especially since the husband gets to go to more fun places than I do for work, so i can tag along with him! So nice! 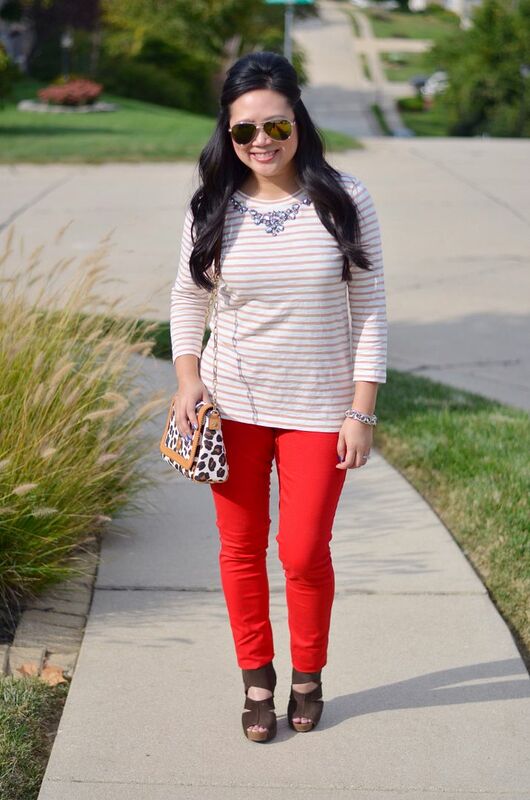 Loving your pants with that leopard print bag! Thanks! One of my favorite combos! Appreciate you popping over here! I have always wanted to go to Montreal. Take lots of pictures. It is supposed to be beautiful and have great food. Definitely will take a ton of pics! Can't wait! I really love this one! 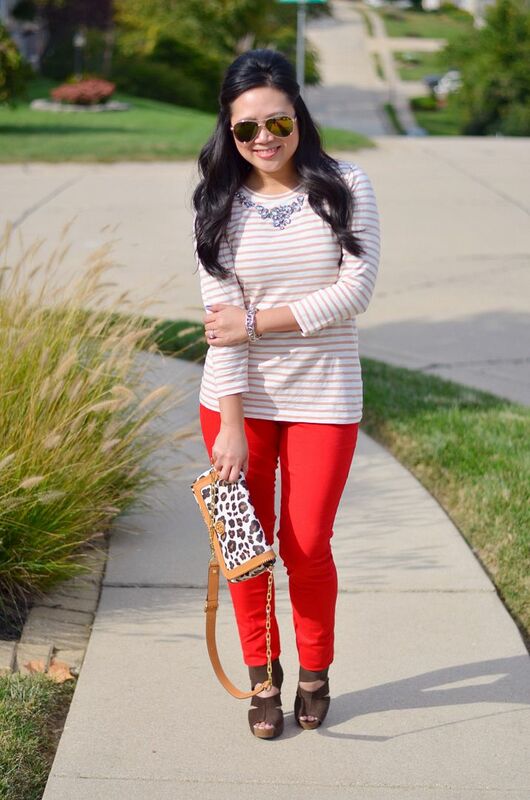 Stripes, red, and leopard? Fall heaven! And how exciting that you are going to Montreal! Take a ton of pictures! Yes, SO excited! Can't wait to recap everything for you guys! I love that top--I don't blame you for having multiples of it! It's great with those fun red pants too. Have fun on your trip--what an awesome place to visit! I'm in love with your heels! I can never find a flattering pair of brown/chocolate colored heels. I have family in Montreal but they usually come to the states, I haven't made it out there in years! I definitely need to make it back. Enjoy your trip! You know, these are the *only*pair of chocolate shoes I own. Mainly because of the same thing you said - it's hard to find the perfect pair! These are so fun though, I just love them. I love stripes with red and I wish you all the best. Thank you so much, girl! I liked this combo a lot! I haven't yet been to Montreal, but it looks SO pretty! Brush up on your French! =) Love this bright red color on you too. Amazing how much French there is! I mean, I expected it, but at the same time I didn't, if that makes sense! It truly is like you are in France! I love it!